Anonymous sale; Sotheby's, London, 18 19 May 1967, lot 173. The C. Ruxton and Audrey B. Love Collection, Christie's, New York, 20 October 2004, lot 443. When this table was sold in 1967, the provenance given for it was the Sala dei Fiumi, Palazzo Ducale in Mantua. The palace was intially built by the Bonacolsi family and substantially enlarged by the Gonzaga upon their conquest of power in 1328. Several further enlargements created a complex ducal palace made up of buildings with 500 rooms, courtyards and gardens. The palazzo interestingly also included the Sala dei Fiumi (Gallery of the Rivers), which was orginally constructed in 1579 - 80 and re-decorated during the Hapsburg reign in 1773 - 75. Commissioned by Maria Theresa, the walls were painted with frescoes of the rivers Po, Oglio, Mella, Chiese, Secchia and Mincio, by Giorgio Anselmi (d. 1797). Unfortunately the inventories of the palazzo of 1787, 1810 and 1828 do not seem to mention a table that corresponds to the offered lot in the Sala dei Fiumi. However, the Mincio river flows through Mantua and it is thus very probable that the table was indeed conceived for a building within the city and possibly the Palazzo Ducale. The purchasers of this lot in 1967 were noted collectors and philanthropists, C. Auxton and Audrey B. Love. The breadth and diversity of their extraordinary collection encompassed Imperial Chinese enamels, Roman sculpture, European furniture, silver and ceramics. The auction of their collection in 2004 realized over twenty-two million dollars which endowed a foundation in their names so their philanthropy could be continued. The Loves were generous to museums and loaned items for several exhibitions. Items from their collection were donated to several museums including the Louvre, Versailles, Malmaison, the Metropolitan Museum of Art and the Museum of Fine Arts, Boston. Very little is known about local craftsmen in Mantua, but it appears that there were few with the skills to carve tables of this type. However, it is believed that many of the major art works for the Palazzo Ducale in Mantua were imported from other artistic centers. 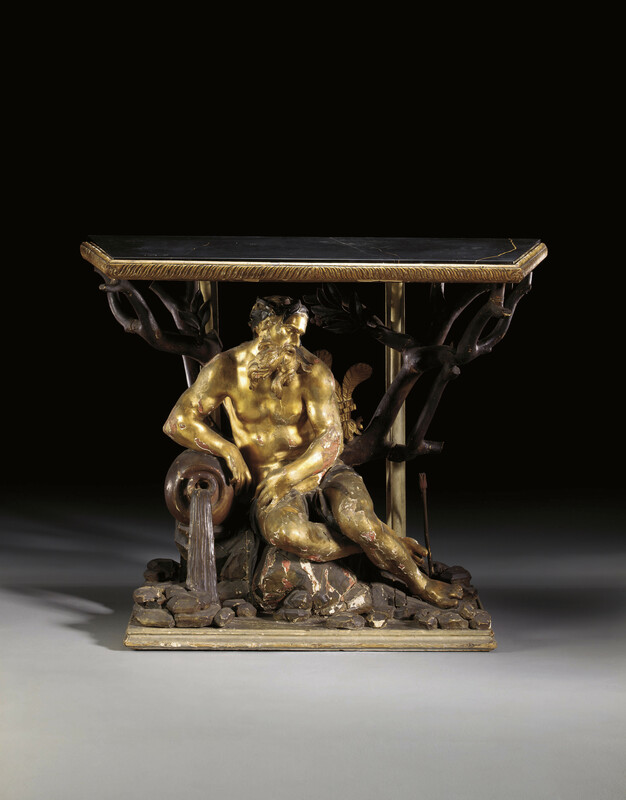 This console table, with its reclining river god and table supported by naturalistic branches, is indeed related to a group of tables executed in Rome in the 17th and early 18th centuries. Noted examples include one in the Sala dei Paesagi, Palazzo Colonna, Rome, which features two bound slaves flanking a central tree supporting the top (E. Colle, Il Mobile Barocco in Italia, Milan, 2000, p. 114). The tree trunk and table frame of that example is recorded as having been carved by Isidoro Beati shortly after 1688, while the slaves appear to have been sculpted by an unidentified craftsman. Very few such carvers are indeed noted in the Colonna archives. Inspirations for this table would certainly have been taken from places such as the fontana dei Fiumi in Rome, carved after Bernini and completed between 1648 and 1651, while the origin of the reclining river god is probably to be found in the Nile and Tiber antique Roman sculptures that were in the Belvedere sculpture court in the Vatican until 1770. It is interesting to note that the fully gilt examples in the Palazzo Colonna are recorded as having been painted in differing colors originally, indicating that the appearance of the offered lot is probably much closer related to the originals than the examples in the Palazzo.